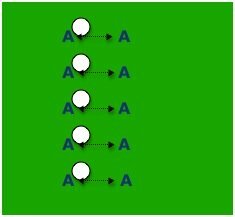 Ball touches are one of the best ways to warm up your players, while having them work on all their soccer ball skills in a quick, efficient format. - For these soccer ball skills, have 1 ball per every 2 players, who stand roughly 5 yards apart. - Have players get 10 touches for each foot, on each area (area's listed below). - 1 touch passing, 10 each foot. - 2 touch passing, 10 each foot. - Side foot volley back to hands or feet, 10 each foot. - Laces volley back to hands or feet, 10 each foot. - Thigh, then volley, 10 each leg. - Chest, then volley, 10 total. - Players should perform this while on their toes throughout the exercise. - All passes should be done as accurately as possible. - 5 minutes for this soccer ball touches warm-up drill.